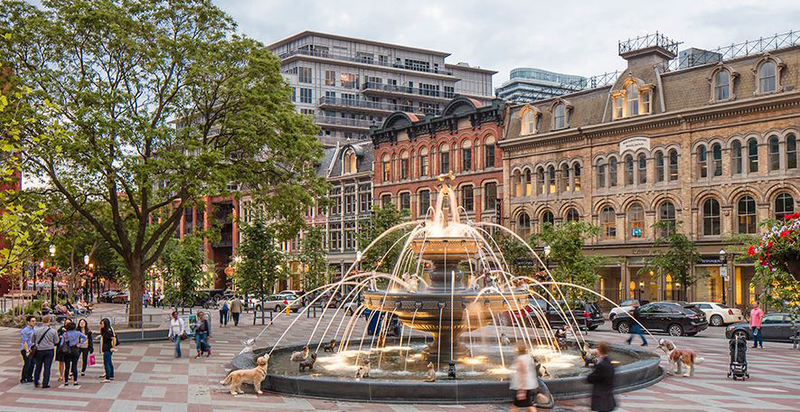 Berczy Park is a 3,606 square metre public park located in the triangle of land between Wellington, Front and Scott streets, across the St. Lawrence Centre for the Arts. The space has been a public park since 1980, before which it sat vacant or served as a parking lot. Over the last few years, the City of Toronto has been working closely with the local community to plan the revitalization of the well-used and well-worn park. Berczy Park is named after William Berczy, a German-born architect, surveyor, and writer often considered a co-founder of modern Toronto with John Graves Simcoe. Berczy was also a painter, most famous for his portrait of Mohawk chief Thayendanegea (Joseph Brant). Park and street construction began in 2015 by Somerville Construction of Toronto. The design was completed by celebrated landscape architects Claude Cormier + Associés of Montreal. The park includes a wider, central plaza with granite mosaic paving, wider sidewalks along Front Street and Scott Street, grassy berms and garden beds. A mix of new tree species was planted in state-of-the-art Silva Cell growing chambers. The park's historic centrepiece, a large fountain, has been replaced by a new two-tiered fountain with a unique and whimsical theme. With its opening in spring 2017, 27 dog sculptures – and one cat – are situated around, in, and on the fountain, each spraying water from its mouth. A golden bone sits atop the fountain. A public artwork, commissioned by the City's Economic Development and Culture Division following a public competition, will be installed on the west side. Toronto artist Luis Jacob's piece is called Jacob's Ladder. Park revitalization also included the reconstruction of Scott Street on the western border. The new street features curbless borders and pavers that integrate with the park design.